still life?, originally uploaded by ebbandflo_pomomama. we're all still coping, the cough is still hacky and the fevers abated. Schools are reporting over 11% in absences which triggers a public health warning to the local authorities but there's no news on what is causing this. The Wee Guy still has a very reduced appetite and mr ebb is still working from home. ... and I'm still relatively OK. The above text was prepared by concerned sellers at http://www.etsy.com as part of the blog-in protest about the US CPSIA legislation being passed. .. and yes, the astute frequent readers among you might have noticed a few leetle changes (OK it's more a WTF? moment as I wrestled with uploading templates and reinstalling widgets - apologies to anyone trying to view as I tweaked, refreshed and shuffled). .... but now I have a 3-column blog (portable crafting has gone trio too, it was the 'guinea pig for this little experiment). There's still a little shuffling around to do as I'm not too happy with the layout - I want clean, minimal and not too uncluttered but with all the stuff that was in the previous version! I have had plenty of time to do this recently since we are All stricken with a mighty lurgy. 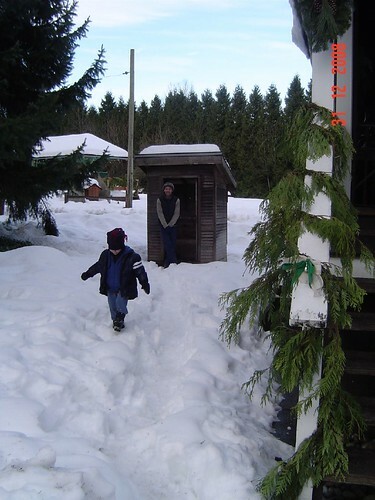 The Lower Mainland cold has swept thru the family, forcing mr ebb and The Wee Guy thru highs and lows of fever. So far we've had one trip to ER, one bottle of Tylenol and a lot of sweating. I just feel constantly nauseous with coughing and have no energy. So there's a forlorn little pile of crafting projects waiting for me, including an intriguing choker with some valentine's fuzzy balls (dittoimage missing! ), but I have finished my new beret and the thank you cards are waiting for their envelopes. These are printed on card blanks with room for The Wee Guy to write and decorate - makes life so much easier (especially since mr ebb doesn't seem to think it's his job to oversee the gratitude platitudes). 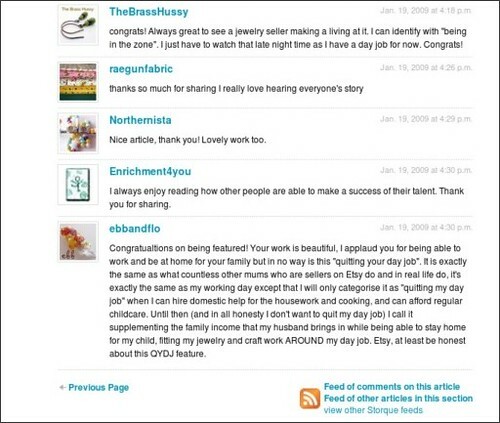 PS: there's no point in relisting on Etsy these days - see here for why! addendum: did a flickr workaround for the pics, good old flickr! SPT 16th January 2008 - a day early ..., originally uploaded by ebbandflo_pomomama. Hello, my name is ebb and (shuffles) I have a shop on ArtFire. 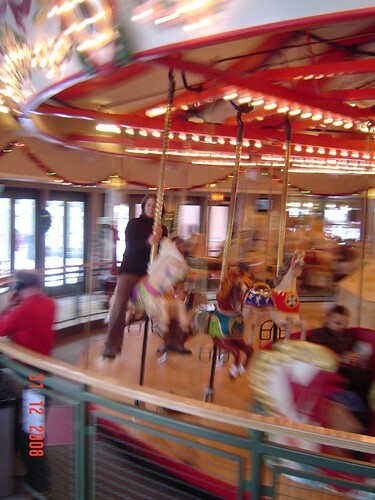 This is my entry for the Blogfire Guild of ArtFire January carnival - introducing myself. 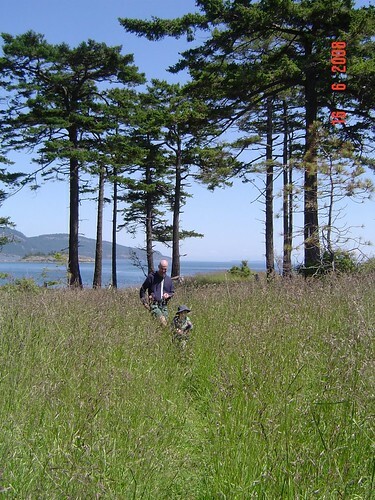 I'm a stay-at-home parent of one very active wee guy, and for reasons of sanity I try to craft in, around and in spite of family life every single day. For this reason I have developed a strategy (manic gleam lights in twitchy left eye) - Portable Crafting (grins full toothed like a maniac). wire ... metal ... fibre .... 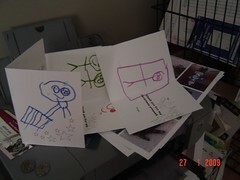 I try to get all of these mediums into whatever I am working on ..... usually I succeed (giggles). 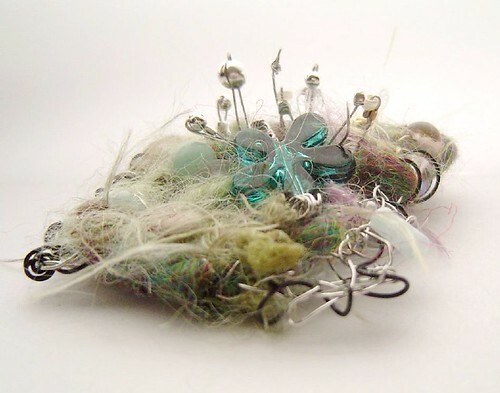 I make wire crochet cuffs, 'ebb' fine silver jewelry from Art Clay and a weird category of accessory called flotsam which includes wire and fibre felted together. Very fluffy. 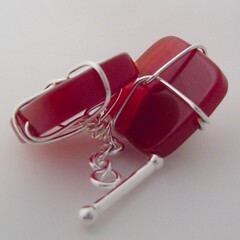 ... and after some bullying by mr ebb I also make cufflinks. treasury timesandchimes jan 25th 09, originally uploaded by ebbandflo_pomomama. Well, it is according to my shipping notes! sent me a convo to let me know that my hot pinks copper orbtials choker was featured in this gorgeous list of valentine's goodies. thank you. since I don't visit treasury at all these days (and i don't stalk my page views obsessively either) i would have missed this one. NB: there are other hot pinks coordinating items in this set and other valentine's day items in my Etsy shop. On an ArtFire note, I spent a very productive hour yesterday evening listing handmade earwires in my studio. Whew! Light speed with the one page listing process - there were not bugs, glitches, reloads or anything else to slow me down. I also listed this dainty glass pendant in my valentine's shop section. 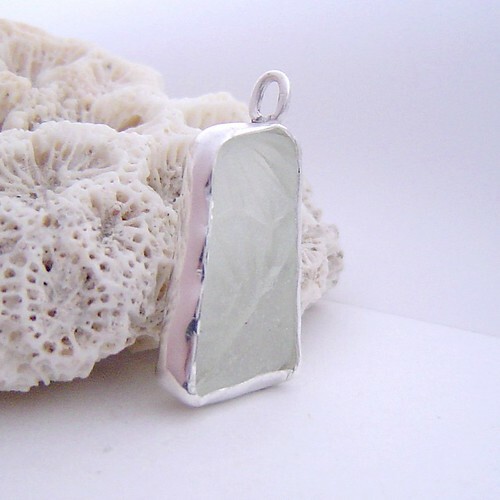 It's scottish sea glass, gathered by me on my last trip back to Aberdour and set in a fine silver bezel. This is the first one I've tried - I adore it and will be preparing more of my collection in a similar setting. It's also a perfect valentine's day present .... or hint! 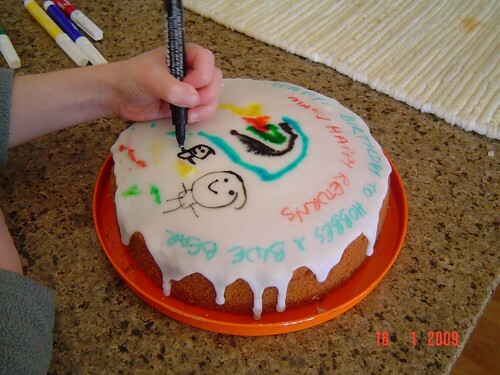 artist in residence - cake decorating, originally uploaded by ebbandflo_pomomama. 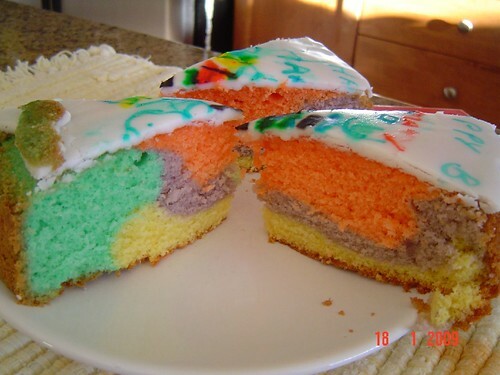 We made Rainbow Cake (thanks to abitabite tweeting me with a link to The Omnomicon) for some of the wee guy's plushie friends' birthdays. It was a huge success! What was intended as one birthday soon multiplied and over the next days we celebrated just about every stuffed thing-in-the-house's anniversary. 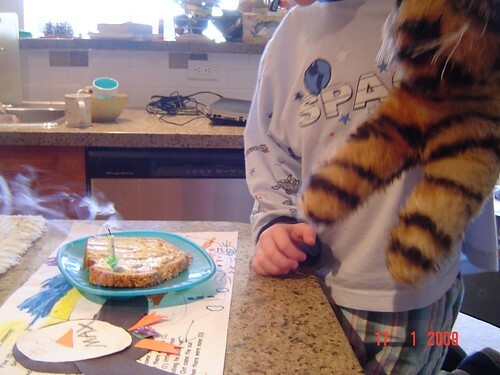 I think this was probably in retaliation to an earlier 'celebrate with toast' attempt by me to avoid making a cake. 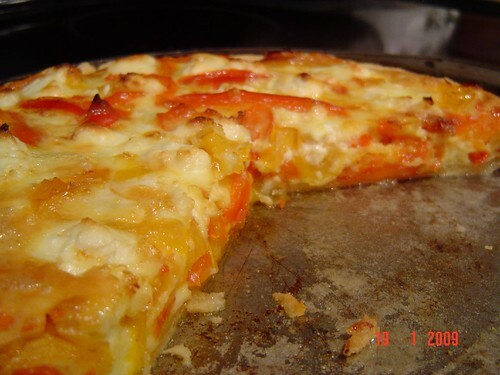 Another recent sustenance, borne out of the guinea pigs refusal to eat the bulk order of red, orange and yellow peppers, was this caramelised peppers quiche. Very tasty! Etsy :: The Storque :: Spotlight :: Quit Your Day Job: realisationcreations, originally uploaded by ebbandflo_pomomama. ... and that's probably not all! Currently according to the Etsy definition I have in fact quit my day job since I am running a home-based craft business around my family, supplementing the income my husband brings in. But since my day job is being a SAHM who crafts in, around and in spite of family life it would be extremely difficult for me to quit it, pay someone else to do it for me and still contribute to the household income. Naaah! I think I'll continue doing things my way and call it supplementing the family income while continuing to be the stay-at-home parent. It's more like "Double Your Day Job" in reality. everfailin', originally uploaded by ebbandflo_pomomama. any guesses who this is for? purity orbital detail close, originally uploaded by ebbandflo_pomomama. OK so while Etsy is busy insulting everyone larger than a size 8 UK let's get down to some serious wedding talk. lotus events is holding its first ever Vancouver alternative wedding show, Indie I Do this weekend. The show takes place on Saturday 17th January at Heritage Hall on Main Street (at 16th Avenue) between 11am and 6pm. It promises to be a fantastic event for those who do not want the traditional meringue and penguins wedding set up. The line up of local indie designers is awesome so get on out there and get hitched in the way you want to. FYI I got married in midnight blue velvet with a black velvet cloak so I am already a big fan of the non-trad bridal gear. 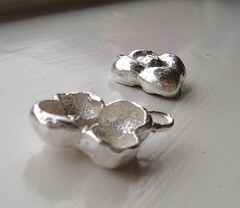 I don't have any pics of The Event online so far but I am selling my own bridal range of fine silver wire crochet and classic groomsman sterling silver cufflinks. view from the deck d15d/365, originally uploaded by ebbandflo_pomomama. and that's definitely worth blogging about (see my View from The Deck flickr set to realise why!). mod circle glass pearl earrings whole, originally uploaded by ebbandflo_pomomama. So I finished a crap-load of pending tasks in the first week that the Wee Guy went back to school after christmas ...... but what do I do now? I completed my custom orders of pendant and earwires, my inventory is ready for a craft boutique .....tum tee tum (sound of fingers drumming on desk) .... what know? I truly hate getting to my afternoon off (while he's at school) and having nothing productively crafty to be getting on with. A Big Waste Of Time thank you! custom bud pendant side view, originally uploaded by ebbandflo_pomomama. Just a quick blog post today. I finished this custom project last night and am very pleased with it. 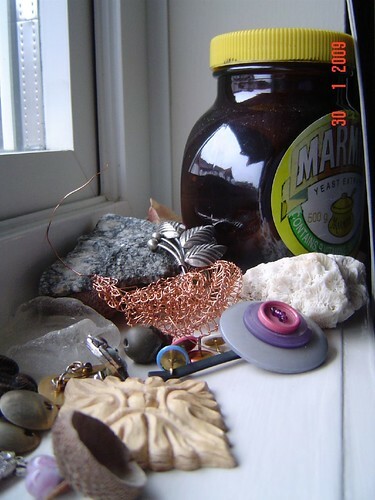 As a side note, you can see also the photography of shiny things is improving with my window shelf lightbox. (I do have bigger and better aims with the photography btw since discovering this excellent DIY version on the Craft blog). ... but back to the pendant. 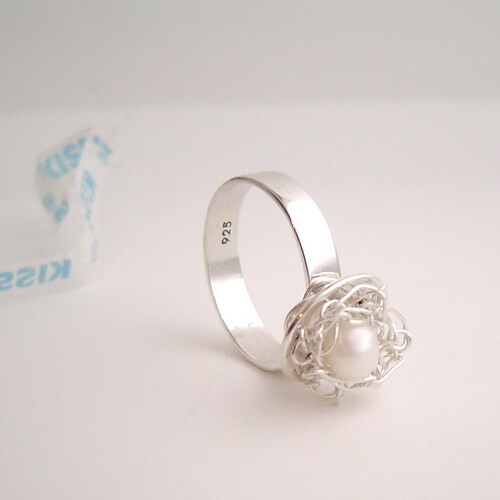 It's made from sterling and fine silver. First I cut a disc then dapped it to form the concave surface. 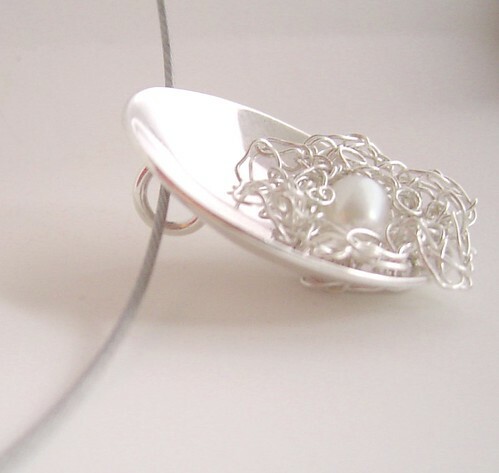 Holes were drilled then a nest of fine silver woven to trap the single freshwater pearl. 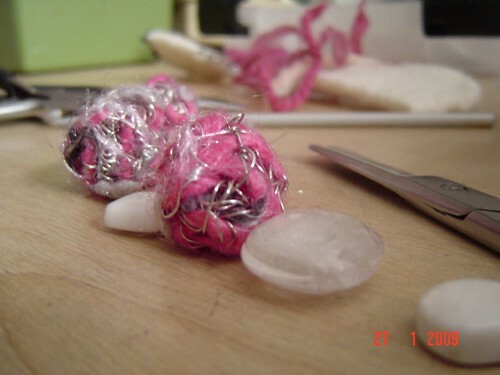 Oh, and a bail was soldered to the reverse somewhere appropriate in the whole proceedings. 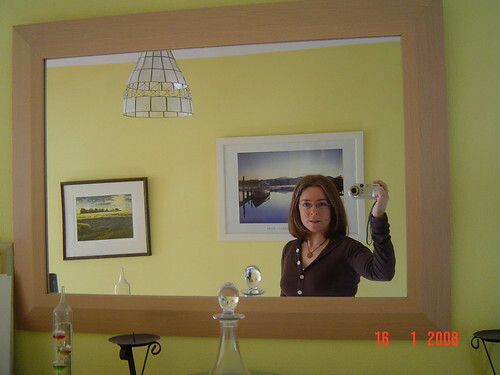 The finished pendant is hung from a stainless steel necklace, highlighting the cool modernity and uniqueness (!) of the design. I also fiddled about with some matching earrings and oh boy, my eyes and fingers were tired at the end of it (but worthwhile!). Why custom? 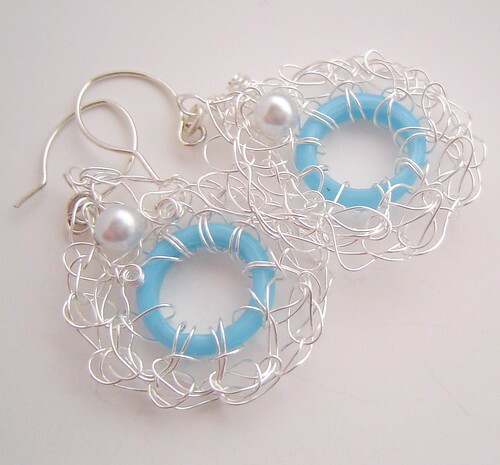 Well, there's a blue glass pearl version for sale in my Etsy shop but the customer preferred white for her birthday. I hope she likes it! I loved making it. peanuts, originally uploaded by ebbandflo_pomomama. In the winter we load pinecones with chunky peanut butter to give the feathery ones a litle extra nutrition during the snow season. It's loaded with fat and protein so hopefully will allow them to maintain good body condition while natural food is hard to locate. If you've been following the "view from my deck 365" recently you will know exactly what I'm talking about. 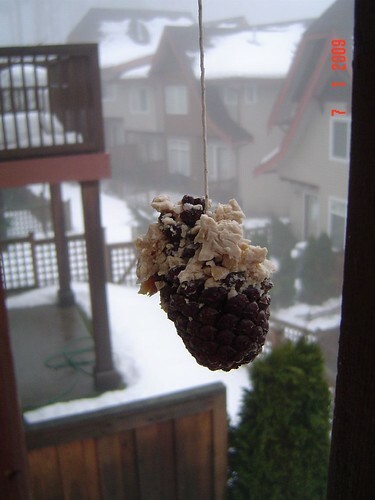 The two fat feeders, peanut butter pine cones and sunflower seed bell seem to have worked as the chickadees and others (who embarrassingly I do not know having grown up with another continent's domestic birdlife) are flocking around the deck once more. We hang our feeders every winter, filled with good, nourishing treats as advised by our local wild bird shop and are rewarded year round with some excellent visitors. Apart from the chickadees I have seen woodpeckers, robins, twohees and some cute speckled things(either siskins or a finch!). In the summer we also see Anna's humming birds though I'm still trying to work out a feeder regime for them. Our beautiful blown glass feeder is useless cos when full, the spout falls out spilling sugar solution all over the deck. The cat is totally entranced. The food scarcity is making the birds very bold (not that she has any chance of getting to them). So what about the tale of two etc etc.? Well one ecommerce site hung out its feeders good and early, so the sellers there are in great body condition. The other, well they're just handing out pretty crappy peanuts sporadically as usual, the feeding table is still full but satisfaction levels are low. Which feeding table will the birds be flocking round next winter? bud ring standing, originally uploaded by ebbandflo_pomomama. will be available soon on ArtFire. heart drops, originally uploaded by ebbandflo_pomomama. .... but round here it's snow that's really in the air and the ears. Must get on with Valentine's Day listings! 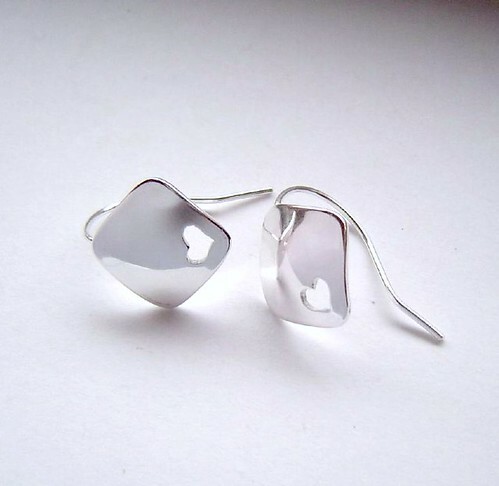 I've just made my second pair of these dainty sterling silver heart drops. Eventually they'll be available as a custom listing, probably on ArtFire. They are sweet, dainty, feminine and match the heart on sleeve cufflinks which I also must get around to listing (just finished editing the pics)! These beautiful white agate and sterling teardrops are already listed for sale, and would make a gorgeous valentine's gift for a special person. 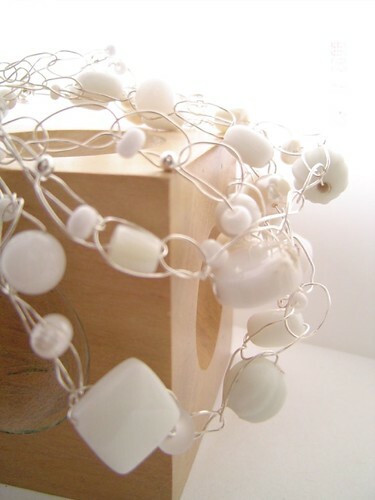 Partner them with "purity", a fine silver wire crochet bracelet with white jasper, shell, vintage glass and freshwater pearls to complete the deal. 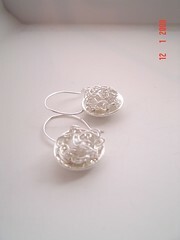 My last suggestion for dainties to bestow on the lobes of your beloved are these fine silver blossoms for sale on Etsy. Although they look quite chunky they are in fact hollow (as shown below), having been formed around a cork model I made. During the firing process the cork burns away leaving a fine silver image which is truly one of a kind. 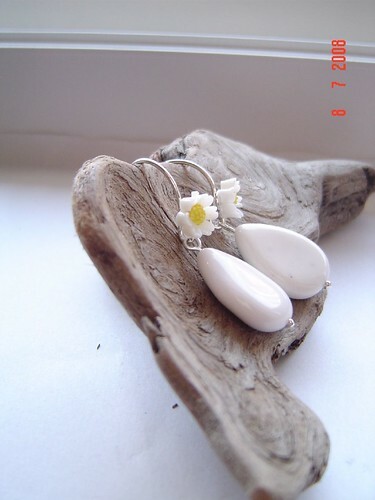 The finished earrings are accented by gorgeous creamy white freshwater pearls. It's snowing again and we're snowed in again. We're also running out of parsley but don't tell these guys. surreality, originally uploaded by ebbandflo_pomomama. What is 2009 going to be like? Will it be the 'stop i want to get off' ride that was 2008 (for me at least) or will i be able to see events in action crisply. Time to start thinking about Valentine's Day unless of course you are the marketing department of Etsy who seem to think that gifts can be purchased and received at the speed of light (oh maybe it can in NY). Once I've 'got rid of the family' back to work/school I'll be able to set some heart-flavoured goodies into action. See - they're already on my workbench! 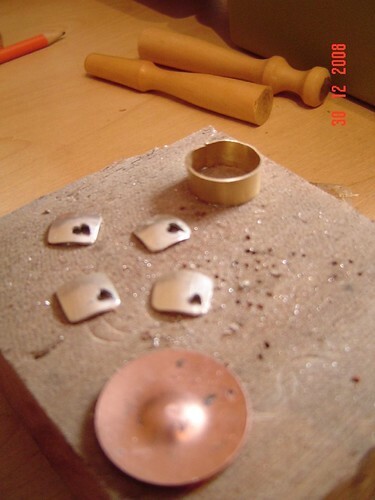 I'm planning some more 'heart on your sleeve' cufflinks and some heart drop earrings. 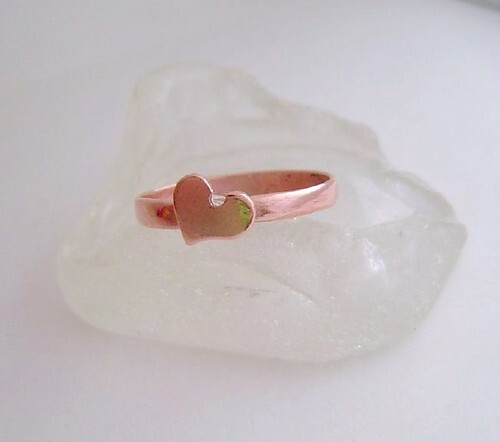 This dainty sweetheart copper ring will also be making an appearance. Meanwhile there are two polymer clay hearts pendants listed here and I've set up a valentine section in my etsy shop. come to the netty!, originally uploaded by ebbandflo_pomomama. 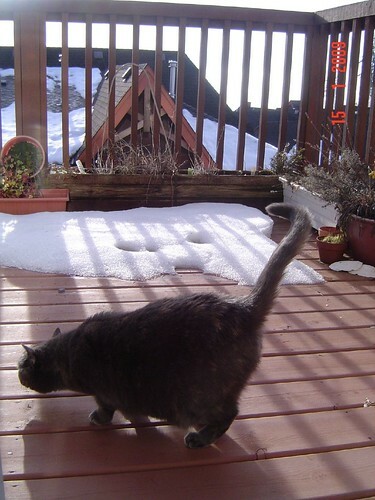 welcome 2009. there's fresh snow on the deck this morning so thank goodness we don't have an outdoor privy (but our uncollected garbage is now buried). 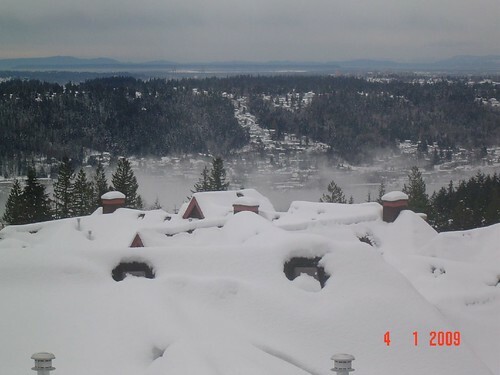 today's events will be snow-related and local as it looks like we might be cut off again. the sledge needs a bit of duct tape to stabilise a handle and we've made a snowcat angel with Grizzy cos she wanted a look at a pile of snow! we got a phone call from my mother, jubilant that she had caught us in bed at just before 9am, to wish us happy new year. in reality the wee guy had woken us earlier by walking noisily into our bedroom and standing silently at the bedside, willing us awake.